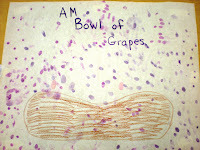 This title is a shout out to my helper, Mrs. T., at school. She just loves to say purple murple. I hear it quite a lot during purple week. Plus, she was a good sport when I gave her a purple paint shower this week so she deserves some recognition. Thanks Mrs. T! 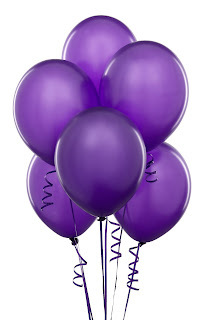 Purple this week. 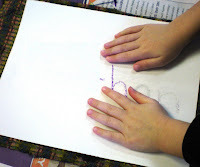 We had lots of fun with it. 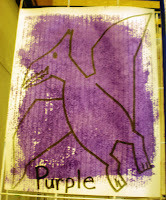 For the first page of our book we painted a purple pterodactyl. 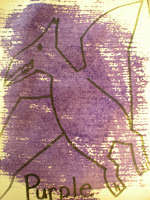 My plan was to get to the fabric store and buy some fabric with a good texture to it. Well, sickness hit at home and I was unable to trounce about. 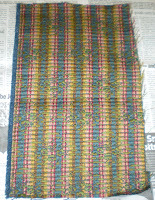 I got lucky and found some heavy fabric in our closet at school and used that. I wanted to give the pterodactyl a "leathery"skin type look. 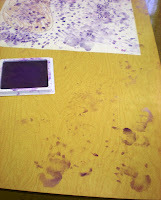 I took the material and had the children use the rollers to roll some purple paint onto the fabric. 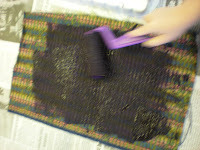 I then had them press and rub their picture against the fabric to get the print of the fabric on their paper. It was pretty fun--first time I had ever done this. 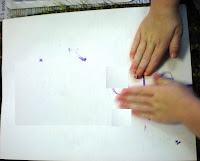 They thought it was great that they were putting a piece of paper with no color on it against some fabric and it was turning purple when they pressed it. 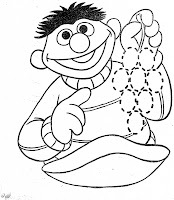 The second page was a picture of Ernie from Sesame Street holding some grapes. 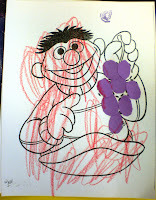 I had precut some grape shapes. 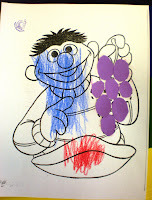 The children glued the grapes on and then colored the picture. 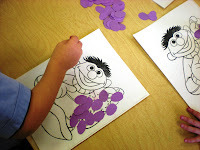 Our other purple fun went along with our good foods discussion. 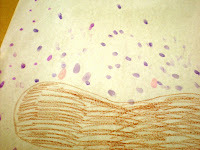 I had drawn a "bowl" on a big piece of paper--so I'm not the best artist. 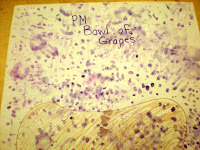 Then I had put out purple stamp pads so that the children could use their fingerprints to make grapes in a bowl. Again--lots of fun. 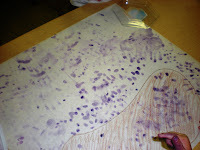 You will notice the afternoon class got REALLY into this activity. 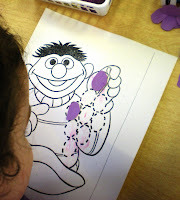 I tried to stress that they clean their hands when they were finished, but I'm sure we'll be finding purple handprints on toys for the next couple of weeks. Only a few more colors left. Next week we're on to brown. That fabric printing is a cool idea. I'll bet I have some old burlap or something in my storage closet as well. Thanks for sharing this. I love the fabric prints! 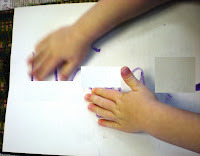 I will be using this for our creative art corner. That's a lot of purple! 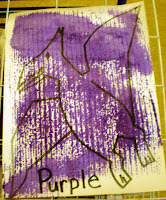 Neat idea with the fabric and purple paint!